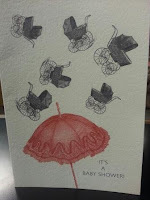 Saturday Gift Post--Halley's Last Greeting Card Round-Up. Halley is off to Madison, but first she and I sat down to talk about some of her favorite cards. * I had her photograph the cards and email them off to me. They never got to me, so if they went to you instead, hope you enjoyed them. Daniel: Your first pick is the Ryan Berkeley black bear card. Halley: I never pick blank cards but this is great. 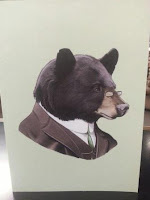 It reminds me of the bear with a monocle pillow from Spitfire Girl that Mel and I tried to get you to order. Daniel: I still insist it would be mistaken for furniture, and would quickly be stained and unsellable. We also have Ryan Berkley designs as Ipop magnets, and I was in a gift store in Providence that sold the Ryan Berkley prints. There's a much larger selection of animals. Only four come as greeting cards. Halley: You could frame the cards! Now I'd like to discuss the "It's a baby shower" card from Black and White and Red All Over. I hope I don't have to give this card to anyone anytime soon. Daniel: For all you know, you have a lot of friends that are trying to have a baby on purpose. Like cards in plastic wrap, it's blank inside, and yet all our customers try to open them anyway. Halley: Some people never learn. You see them opening one after another and all of them are blank. This is not my favorite card from Black and White and Red All Over, but you wouldn't purchase the more vulgar but ridiculously funny ones that I enjoy. 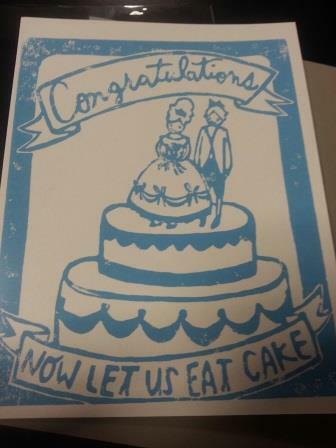 Halley: How about this wedding card from Ghost Academy? Isn't that cute? Everyone should have Marie Antoinette hair on their wedding. 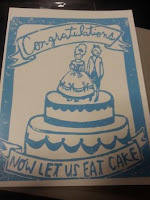 I also think that "Now let us eat cake" should be the Boswell motto. Daniel: Eating cake is a trend, not in just wedding cards, but also in birthday cards. I just brought in the "cake ninja" card from Peaceable Kingdom. Halley: I don't think I'm familiar with this one. Could I already be out of touch? Daniel: Ghost Academy cards are block printed by hand! I've never seen anything like them. The only thing better would be if they used potatoes. Halley: I used to do potato prints when I was a kid. Another blank card . Daniel: This one is from Sarah Andreacchio and is called "Swamp animals." If this sells well, there are about eight diffren designs in the line. Halley: It reminds me of when I went to Georgia. I didn't see any alligators or poisonous snakes but I did hear a lot about them. Daniel: You can tell these animals are not poisonous because several of them are wearing jaunty hats. 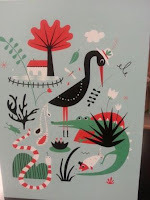 Halley: I love this thank you card from The Found. I wish we carried it when I was sending out multitudes of thank you cards. Daniel: I generally don't like all type cards, but in this one, the letters are more like individual portraits. Laura Szumowski, the artist, has a number of different card designs. Collect them all! Halley: Greeting cards are the new Pokeman. 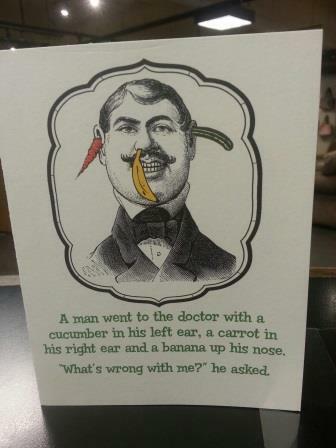 And now for the most hilarious card ever, at least when it comes to the ones that are in good taste. Daniel: I know you wanted to print the punchline, but I don't want to give everything away. Halley: I wish I were sick, so someone would give this to me. But not that sick. Get your flu shot! Daniel: Fresh Frances cards get better and better. Halley: I liked them when we first got them, but the new cards are "Fresher" Frances. And now for my friendship card. Daniel: And what is that? Halley: That's when Mel and I find a card that we really like, but it's weird to send yourself a card, so we each buy it and send it to each other. Daniel: My card sales are going to go down 20% after you leave. Halley: Don't worry. I have you covered for August. Daniel: What's the best card store in Madison? Halley: I don't know. If anybody reading this knows the answer, please let me know! Note, not favorite cards of all time, just of recent vintage. Otherwise, we'd have to go back to "thanks a brunch" and "dog we poppin." The Kids' Indie Next List Has a Plethora of Great Recommendations for Fall...Here are Our Favorites. 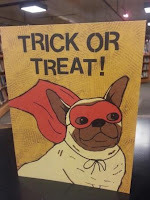 The kids' Indie Next recommendation list may be seasonal (as opposed to the adult list,which is monthly), but it is jam-packed full of great reads. A number of titles are Boswell favorites, including some that are actually from my fellow Boswellians. First of all, let's highlight the titles from authors who will be appearing at Boswell this fall. The Song of the Quarkbeast: The Chronicles of Kazam, Book 2 (Houghton Mifflin Harcourt), by Jasper Fforde (#10 on the top ten favorites). Steelheart (Delacorte), by Brandon Sanderson. Bugs in My Hair! (Blue Sky Press), by David Shannon. Mr. Wuffles! (Clarion), by David Wiesner. The Beginning of Everything (Katherine Tegen Books), by Robyn Schneider (#9 on the top 10). I thought I'd also include a few titles which Boswellians nominated. Mel and Hannah are both huge fans of: Counting By 7s (Dial Books), by Holly Goldberg Sloan (#4 on the top ten favorites) . If You Could Be Mine (Algonquin), by Sara Farizan (#8 on the top ten favorites). The Year of Billy Miller (Greenwillow), by Kevin Henke. There are recommendations for all kinds of wonderful books, from picture books to teen novels We've got printed brochures at Boswell, or you can just use this handy checklist. I processed the statement that I would love to have every Indie Next Great Read in a month at Boswell, and in the end I decided it was not true. I think it's nice to have two or three of the featured titles per month on the list, just so we can bedazzle the brochures with our event stickers. But once you get to six featured authors, which is what we have for September, the brochure starts getting crammed with information. Plus you have all the paperback originals, the nonfiction titles that wouldn't make this kind of list, and the authors with local ties, and you realize there aren't enough days in the month. 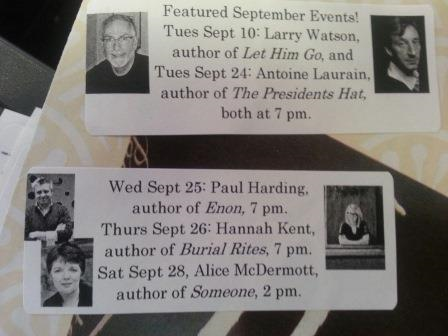 It turns out one of the featured titles, Louise Penny, already had her event with us. But we've got five other wonderful authors coming, and I wanted to share them with you, along with their Indie Next recommendations from booksellers around the country. All are at Boswell. Let Him Go: A Novel (Milkweed), by Larry Watson . The President’s Hat (Gallic), by Antoine Laurain. Hey, that's Sharon! Congratulations. You'll be seeing that quote again, for sure, but it will be mixed with recommendations with me, Jane, and Anne. Interestingly enough, we've had multiple reads on all of these upcoming event books. I told Stacie it was our Accidental Book Festival. If someone told me I could see Antoine Laurain, Paul Harding, Hannah and Kathleen (not sisters) Kent, and Alice McDermott in a week, I'd definitely adjust my vacation plans. And I haven't even mentioned Karen Joy Fowler, who is appearing for her recent novel on Monday, September 23. You can read the rest of the Indie Next recommendations for September here. 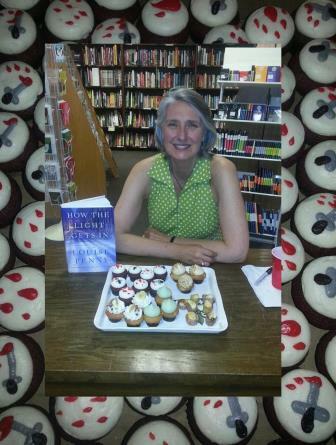 A Tale of Two Event Wrap Ups--Louise Penny and Clark Howard. We had our first ticketed event of the season and it wound up being a lot of fun. When I made our proposal for a Louise Penny event, I had no idea it would be the launch. You normally think of that being the hometown event, but in this case, a Canadian store won't add to the first-week sales totals so her bookstore of record gets a pre-launch. Sarah gave us instructions that we had to make the event fun, so of course we went to our go-to "fun" food, the mini cupcakes from Milwaukee Cupcake Company, and did an assortment of Canadian flavors (maple, caramel apple, pear) plus the bloody red velvets. The maple was actually banana maple pancake, and it turns out bananas have a tiny bit of trouble with the Canadian climate, a minor error on my part..
As I may have written before, Nick and I were chatting about turning poutine (which I sometimes spell incorrectly) into a hand held snack. He came up with poutine cups, which were mini half potatoes, hollowed out and fried, with some warmed up gravy and a cheese curd. I think it's Top Chef worthy, don't you? Or at least Top Chef Canada. As I mentioned to the crowd, I started proposing an event with Louise Penny back in 2006, after we hand-sold an unusually large number of copies at Schwartz. While I was the buyer at that time, our marketing guru Nancy would consult with me about the event grids, and I distinctly remember a request for book two, as well as all subsequent titles. The response was enthusiastic. The crowd was in her hands. I think by the end of the evening, we could qualify as groupies. And everyone wanted to know whether we could sell Vive Gamache mugs, two of which Ms. Penny brought to the event as give-aways. We were going to give them out as door prizes to customers, but in this case, I convinced her that the right thing to do was offer it to our two biggest hand-sellers of her titles, Anne and Sharon. Do we still have signed copies of How the Light Gets In? Yes, we do. Speaking of groupies, the next night we went to the Sunset Playhouse in Elm Grove for an event with Clark Howard, who was close to the end of his book tour for Clark Howard's Living Large for the Long Haul: Consumer-Tested Ways to Overhaul Your Finances, Increase Your Savings, and Get Your Life Back on Track. I don't know if we had the biggest turnout of the tour, but we certainly had the most comfortable crowd, at the Sunset Playhouse, thanks to a partnership between The Sunset and the Elm Grove Library. Before the event, 15 lucky winners from 620 WTMJ got to have an exclusive meet and greet. OK, it was a little confusing that the meet and greet was scheduled for the same time as the public event, but one of the things I've learned is to go with the flow, especially if there are a lot of partners. In the end, everyone was thrilled. One of the things that is great about both Clark Howard and Louise Penny is they are both genuine folks, acting the same on camera as they do behind the scenes. Howard not only charmed his rather adoring crowd (I sometimes felt like I was working the line at MoneyCon) but also the librarians, the playhouse staff, and yes, us booksellers. I know it's complicated when an indie bookseller (we were the only indie* on the tour, as Dayton's Books and Company is owned by Books a Million) who is always trying to convince people that there are circumstances where it's okay to pay more is hosting an author that might not see eye to eye on this. But life is complicated, right? Our move west did net us a slightly bigger crowd than we got in store two years ago, but it wasn't quite the increase we expected. I think the moral is that a core of Clark Howard's fans will follow him anywhere. Offsites are always a tradeoff. You may maximize the attendance by hitting "hotter zip codes" (as Clark's folks noted), but the call to buy is less at an offsite,and your percentage of sales almost always goes down if the event is not ticketed with a book. This offsite was particularly special for me as it was my last hurrah with Halley, who is off to Madison. Her last day is officially Thursday, but it's not the same as driving to Elm Grove and stocking up on close-out cookies. The good news is that we're not losing Halley after all; she just got a job as one of our sales reps! *Under some criteria, Half Price Books also qualifies as an indie as it's privately owned, but multi-market stores are always a different animal. HPB would not be able to join a local first organization outside of its home market of Dallas, for example. And did they sell Clark Howard's book for half price? That is the burning question. New Nonfiction from Rowan Moore, Laura Heyenga, Naoki Higashida, Daniel Tammet, and Tajla Said. Some of these titles, but not all of them, are on Boswell's Best this week. While you'd normally think that September was an important pub month, the publishers seem to like to wait until after Labor Day for their September release, making this week and next rather dry, but September 10 is absolutely packed with books. Honestly, I would have looked at this and moved a couple of titles to August 27. We have no new Boswell's Best nonfiction titles this week, so the ones I'm writing up now are in the carry-over category. If I could read whatever I wanted, I'd probably hve more architecture and urban planning books in my pile. Not textbooks mind you, but books like Rowan Moore's Why We Build: Power and Desire in Architecture (Harper Design). Architecture critic and former director of the Architecture Foundation, Moore looks at structures both historical and modern to look at our changing idea of home, and looks at such disperate projects as the islands of Dubai, the successful New York's High Line and Daniel Libeskind's failed (I'm using copy here!) design for the World Trade Center. Nigel Coates in The Architecture Review notes that Moore takes a journalist's approach and wishes there were more about the radical avant garde. This next book might be called What We Do with Books We Don't Read, but it's actually Art Made from Books: Altered, Sculpted, Carved, Transformed (Chronicle), compiled by Laura Heyenga. One example might be Dave and Valerie's wedding arch of several weeks ago. This book is a survey of folks working in this medium, and it seems like they can do just about anything. It's hard to actual describe this book, but here's Brian Dettmer's website with images from his work. And here's a Fast Company sub-website called Co Create with other images from the book. Hugh Hart notes that when Alyson Kuhn's work "first gained traction via Twitter in 2011, some traditionalists sounded sour notes" but anyone who really works in the book business notes that pulping is a fact of life. The next book is an interesting memoir by a 13-year-old Japanese author Naoki Higashida, discovered by none other than the writer David Mitchell. After finding this book incredibly helpful for raising his own child, The Reason I Jump: The Inner Voice of a Thirteen-Year-Old Boy with Autism wound up being translated by Mitchell as well. From Random House, we learn Naoki, having very low verbal fluency, used an alphabet grid to painstakingly spell out his answers to the questions he imagines others most often wonder about him: why do you talk so loud? Is it true you hate being touched? Would you like to be normal? The result is an inspiring, attitude-transforming book that will be embraced by parents, caregivers, teachers, and friends of autistic children. Keeping to the way different people's minds interpret things differently, Daniel Hammet's newest book, Thinking In Numbers: On Life, Love, Meaning, and Math (Little, Brown). Hammet is a mathematical savant, and discusses how his mind works. Oliver Sacks wrote "The irresistibly engaging book that "enlarges one's wonder at Tammet's mind and his all-embracing vision of the world as grounded in numbers." The book notes that Tammet is nspired variously by the complexity of snowflakes, Anne Boleyn's eleven fingers, and his many siblings, exploring questions such as why time seems to speed up as we age, whether there is such a thing as an average person, and how we can make sense of those we love. Here's an interview from Rachel Mann on Weekend Edition Sunday. And of course, there is one fiction book that went on sale today. It's Louise Penny's How the Light Gets In. Her ticketed event is tonight. Based on how our advance sales have gone, I'll probably see you there. Monday Event Post--Louise Penny on Tuesday (Ticketed), Clark Howard at the Sunset Playhouse on Wednesday, while at Boswell, Janice Clark and Amy Gail Hansen Read Together, Also on Wednesday. Recently our friend Judi sent me an article in the Chicago Sun Times regarding author tours. According to Natasha Wisinski and author Kevin Guilefoile, those days are gone. While it is true that two of our four paired authors this week are both coming up from the Chicago area, not as part of a tour, both Clark Howard and Louise Penny seem to be on a national tour, as traditional as they get. In addition, I've noticed that Unabridged Books of Lakeview has been taking on more events after several years of being dormant. And both City Lit of Logan Circle and Read Between the Lynes of Woodstock are among the area stores that periodically host touring authors, in addition to featuring locals. It's true that the event programs are changing. There is less reading. There are more book festivals. And for the larger authors, there are way more ticketed events. It's true that many authors forego book tours, but oddly enough, the ones that no longer tour, are two of the very authors in the article that they said claim to tour, John Grisham and J.K. Rowling. If big-time authors don't like the tour atmosphere, they don't have to do it. 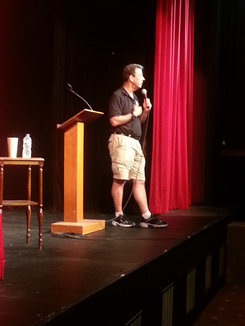 If an author is large enough to do paid speaking events, by all means that's what you'll often see. But for the authors who like it, and for the midsize authors that can't command ticketed events and have the likelihood of getting some extra press on the road and generating good word of mouth, the word on the street is that many publishers who wrote off the book tour several years ago are revisiting it. It's not what it was in 2005, but it's also not quite 2010 either. I think this is a case of when the pundits say to sell, it's time to buy. And now, on to this week's Boswell events. A ticketed event with Louise Penny, which includes a copy of How the Light Gets In. The Store will close to the general public at 6 pm. This event is co-sponsored by L'Alliance Française de Milwaukee. Tickets are available on Brown Paper Tickets. At one point tomorrow, we will close off ticketing on the website and will be able to have walkups. We're the launch for the event, and we've got a nice assortment of refreshments. We'll have an assortment of themed cupcakes from Milwaukee Cupcake Company (Quebecois love maple and caramel apples, I'm told) plus if everything goes right, a poutin amuse bouche plus two kinds of iced tea. Don't forget our recs! "Several circumstances in the life of Inspector Gamache and his friends in Three Pines await illumination. Book store owner Myrna needs help searching for a missing friend, Jean-Guy Beauvoir remains estranged and self-destructive, and Gamache's carefully selected staff is being just as carefully destroyed by the Chief Superintendent. These three story lines converge for a stunning conclusion. Once again, Louise Penny draws you in and holds you captive. I'll be reading and re- reading How the Light Gets In until the next Chief Inspector Gamache mystery is written." "Louise Penny’s latest mystery takes its title from a lyric by Leonard Cohen, one of my favorite singer/songwriters. Chief Inspector Gamache is searching for a little peace from the backstabbing and betrayal at the Surete. Unfortunately, the haven he chooses, the quiet village of Three Pines, produces a murder for him to solve. When a national celebrity is found dead, he must put his personal and professional difficulties aside, and take charge of the investigation. Once again, Louise Penny does what she does best – provides an intriguing mystery which takes second place to the complex personalities and relationships of her main characters." "This is a mystery novel worth staying home for: Cancel those weekend plans, crank up the air conditioner and mute all electronic devices. You’ll want plenty of silence and slow time to savor “How the Light Gets In,” the ninth novel in Louise Penny’s extraordinary series starring Chief Inspector Armand Gamache and his troubled sidekick, Inspector Jean-Guy Beauvoir, of the Surete du Quebec. How the Light Gets In is the culmination of a story arc that has been developing over the most recent books; happily, it is not the termination of the series." Clark Howard, author of Clark Howard's Living Large for the Long Haul: Consumer-Tested Ways to Overhaul Your Finances, Increase Your Savings, and Get Your Life Back on Track. This event is cosponsored by 620WTMJ, The Elm Grove Public Library, and the Elm Grove Playhouse. This is our second event with the very gracious fan favorite Clark Howard, whose show on 620 WTMJ really gets out the troops. This time we're co-hosting it at the Sunset Playhouse, through the diligence of co-sponsor Elm Grove Library, and their dynamo director Svetlana Foley. The Sunset is also co-sponsoring. S.T. VanAirsdale in Slate magazine recently called Clark Howard "the most reasonable financial guru in the bookstore." Howard's new Living Large for the Long Haul "cements Howard as a kind of economist folk hero—a polo-shirted intellectual who can communicate more useful, constructive policy analysis in one chapter than Thomas Friedman gets across in a year of Times op-eds." and Amy Gail Hansen, author of The Butterfly Sister. Tonight we have another great pairing of new authors. Here is Hansen telling Bruce Ingram at the Barrington Courier-Review about the origins of the story. "It was Hansen’s luggage, packed for her 2004 honeymoon in Italy, when during final preparations for the trip she noticed that they were tagged with the name and address of a friend she’d loaned them to years before. As she wondered if they would have been shipped to her friend if they had been lost — and what her friend would have made of that — she realized the idea would make a good story. Hansen hung the old luggage tag on a bedside lamp and mentally filed the idea away until another piece of the puzzle popped up two years later. Listening to a woman in a writers group read a passionately mournful poem about her formerly all-female college going coed, Hansen suddenly realized a women’s college would make an intriguing setting. And Hansen’s debut novel was well on its way." 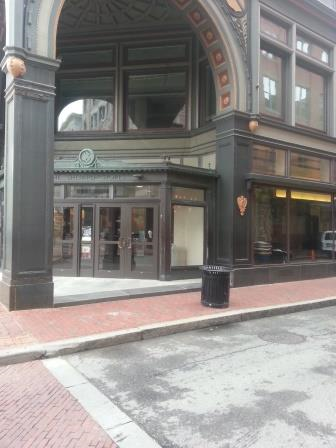 And here is Kathryn Lang in the Boston Globe talking about The Rathbones. "Set in the middle years of the 19th century in Naiwayonk, Conn. (today’s Noank, within the town of Groton), Janice Clark’s debut novel is fabulous — in the word’s earlier definitions of 'suggesting a fable' and 'astonishing,' as well as its modern meaning of 'terrific' and 'awesome.' The Rathbones is both cleverly crafted and a beguiling read, limning (a favorite word of Clark’s) the saga of the Rathbone whaling family. Part fairy tale, part sea yarn (with nods to Melville and Hemingway), part Homeric epic, it is also a story of star-crossed love, spiced with Gothic Poe-like details and a dollop of farce. " "Hold this book to your ear and hear the sea. In Janice Clark's The Rathbones, exquisite prose unfolds with the ebb and flow of the ocean. Each detail rendered therein is as delicate and precise as the thinnest line in a scrimshaw design. You discover the story of the Rathbone family as the youngest Rathbone child does: in fits and starts, in hearsay, in rumor, in gut instinct. Nothing is as it seems: this family has secrets deeper than the ocean. Clark has carved a sharp narrative, elevated with splendidly rendered nautical diction, and will spear you through the heart with it in one stroke. This is a book you'll pine for long after you've returned from its far shores, six-generations wiser, in love with Mercy and the sea." After that, we have an event free holiday weekend so you can enjoy Harley Davidson's 110th anniversary. Our next in-store event is Meg Choi on Friday, September 6, 7 pm. Sunday Bestseller Post--Folks Who Shop Boswell Favor Zealots, Cuckoos, and the Color Orange. I think we've already covered these titles in other posts, but let's see what more we can dig up. Paul Constant in Seattle's The Stranger promotes the Elliot Bay Toby Barlow event for Babayaga by noting " If Barlow can get armies of nerds excited about a book-length poem about a lycanthrope war, a stylish Cold War novel about a spy running up against characters from Russian folktales is a slam dunk." Connie Ogle in the Miami Herald loves the made-up persona of Marisha Pessl's Night Film director: "The films don’t exist, of course; they are the products of Pessl’s dazzling imagination. But they’re so finely detailed and wield such power over most of the characters in this strange, mesmerizing novel that they feel real, maybe something you’ve read about late at night on some obscure website when sleep isn’t even a promise. Even the titles evoke apprehension: Thumbscrew. La Douleur. Isolate 3. Treblinka." 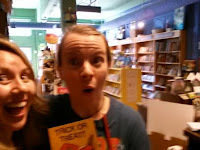 And I missed this interview with Colleen Jurkiewicz in the OnMilwaukee.com for our event with Susanna Daniel. Still worth reading! Here's a tidbit on Sea Creature's inspiration: 'I got the idea from a monologue by Mike Birbiglia, Sleepwalk With Me. It's hilarious, which my book is not. I saw it years ago, the original recording, and I was thinking the whole time, "Oh my God, what would it be like to be married to someone with those problems?'" A book club sponsored by Immunuel Presbyterian Church is meeting on Wednesdays to discuss Lillian Daniel's When Spiritual and Not Religious is Not Enough. Here's Reverend Daniel speaking to Religion and Ethics Newsweekly on the PBS website. I found an interview on the Austin American Statesman site for Turn Around Bright Eyes, but that's for subscribers only. Alas, there'll be a lot less linking in the future, unless the papers choose the limited-number-of-hits option, like the New York Times and the Milwaukee Journal Sentinel, but them's the breaks if it saves the papers. We're one of the designated places to by books for Whitefish Bay High School classes, along with the Barnes and Noble in Bayshore, so you'll see some of their books seeping into our bestseller list if we we're also selling them to the general public, like The Great Gatsby and Slaughterhouse Five. I'm on the fence about putting course adoptions for this list, so you may not see them every week. I was trying to figure out what has led to a resurgence of Ernie Cline's Ready Player One in sales at Boswell. Besides renewed bookseller enthusaiasm, all I have so far is this article in Wired about the cultural impact of Back to the Future. 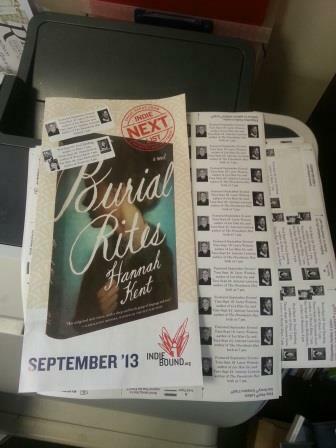 How do you pop a paperback sale when the author isn't touring and book clubs aren't likely? In the case of Who I Am, there's the feud that One Direction has stirred up by using the chords of "Baba O'Reilly" for their own "Best Song Ever"? It turns out that Pete Townshend has been the peacemaker here. According to Jerem Larson at Radio.com, it's not the first time. Harper's teen division is following the playbook for The Hunger Games in a different kind of way than you'd expect. Though they published the paperback of Divergent, they postponed indefinitely the paperback of Insurgent, which was originally scheduled for last spring. Here's Veronica Roth speaking with Cotton Codinha in Elle on boyfriends, style, theology and more. A tidbit:if I were a mature writer, I would want to set a book in 1980s communist Romania." In the book section of the Journal Sentinel, Mike Fischer tackles Archangel, Andrea Barrett's new collection of stories. He notes: "As in prior Barrett collections, the heroes in Archangel are intrepid questers like Sam. While he embraces advances in science, Sam never forgets that a time always comes when every truth begins 'to seem more complex again' — inviting us, as does Barrett, to read beyond the confines of a single story or idea, so that we might grasp what they share and how they fit together." Department Store Saturday--A Visit to Providence, and Via Books, One to Marinette, Wisconsin, Once Home of Lauerman Brothers. This weekend I am visiting my mom and sister before the packed fall schedule leaves me with no travel time. After arriving at Boston Logan, I decided to take the Silver line to South Station and take the MBTA to Providence and walk around for the afternoon and see my old friends Mary Heather and Tim, who moved there from St. Paul. My sister could join us for dinner (it's only about 40 minutes from Worcester) and we could drive back together. I think this is my fourth trip to Rhode Island's capital, though one of them is a high school field trip, and really doesn't count. It's interesting that for a city about the same size as Worcester, and same distance from Boston, it has a very different feel, mostly owing to it not only being in a different state, but has a state capitol too. And while both cities have an unusually large number of colleges, Providence's seem to have more investment in dowtown (or in Providence's case, Downcity), though the recent growth of the MCPHS campus downtown has really made a difference in Worcester. 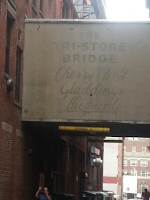 For a city its size (160,000, but with a market area said to be similar to Milwaukee), Providence seemed to have a lot of department stores, compared to the one major local store in Worcester, Denholm and McKay (or Denholm's). Without me doing my normal four hours with library microfilm (or fiche, or however it would be stored now), it's hard for me to really get a feel for the various stores. 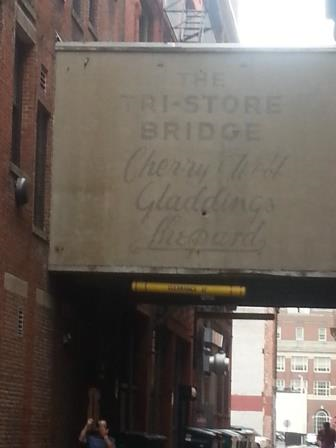 I think that Gladdings, Shepards, and Peerless were all general department stores, while Cherry and Webb, knowing that they continued on as women's special stores in strip centers through the eighties, might have limited themselves to women's clothing and accessories when they were downtown. I can only imagine the bulk of the old Providence Journal in its heyday, with four stores fighting for ad space. Unlike many cities, all the buildings seem to be still be standing. According to this local blogger, the Gladdings building is used by Johnson and Wales University, having closed in 1972. The Peerless building (closed sometime in the 1980s) was turned into housing. 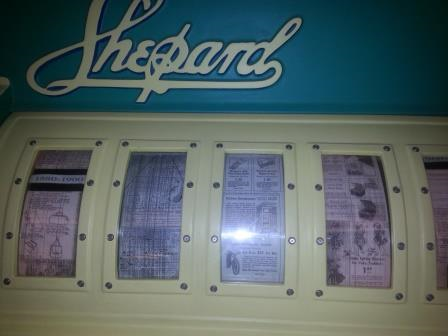 It's the Shepard conversion, that really sparkles, however, as much Shepardness is preserved, from the S insignia to the clock, to old photographs in the lobby. There's this crazy metal sculpture with advertisements from various decades that periodically rotate around a central core. Crazy! Coincidentally at the same time I was exploring old stores, I was reading a new book about a small-town department store with big-city ambitions. Something for Everyone: Memories of Lauerman Brothers Department Store, by Michael Leannah, focuses on Lauerman's of Marinette Wisconsin, which is on the border of Menominee, Michigan. Similarly, Lauerman Brothers grew to about 15 locations, buying stores as far flung as Iowa--the Paul Davis store of Waterloo was renamed Lauremans, as almost all of the acquistions were, and lasted 11 years under their ownership. At one point, they even operated a store in Marinette's twin city of Menominee, The Lloyd Store, which they also ran for 11 years. This branch stuff is hard, which is one of the reasons why I haven't opened a second location. Like Marshall Field's, they also had a wholesale division and like Fields, they even had a manufacturing division, the once very successful Marinette Mills. Much of the joy of department store books are in the shared memories, and there are a lot here. The brothers Lauerman, Joseph, Frank, and Charles, each brought something to the table. It's clear that Frank was clearly the one in charge, partly because he oversaw the stores for close to seventy years. Leannah tries to show the charitable side of Frank, but it's hard to not get the feeling that he was probably one tough boss. I love that Leannah was able to get the rights to so many photos, including newspaper ads, family photos, and displays. Was there a paper handled shopping bag? I suspect at one point, though Leannah notes that for a long time there were no bags, just twine and an attached handle, and lots of free delivery, including from their grocery department (bucher closed 1960 with grocery following a few years later). I love how folks would come in by the train, from the Chicago Northwestern and Milwaukee Roads Depot. Lauerman's would offer a free shuttle back with your packages. For someone who's read a lot of department store books, I still picked up much about the industry itself. Trading stamps? As much as they were a consumer incentive, they also allowed the company to keep tabs on keeping cashier's honest in cash transactions, much like the "if we don't give you your receipt, we'll give you cash back" promotions that were in vogue for a while. And the buying trips? The Lauermans kept prices low in part by weekly buying trips to Chicago, doing a great deal of opportunity buying along the way. They might be from other distressed retailers, or have slight fire damage. Pricing might depend on who else was stocking the item, but they kept people coming through a wide assortment of goods matched with pricing and service. The only thing that confused me was how many clerks and department heads seemed to be on the gruff side. That sort of conflicts with my idea of service, but maybe that's just me. One of the best chapters discusses the five most-memorialized features of Lauermans, and interesting enough, two were sweets--the Downyflake donuts and the frosted malt cones, which I perceived to be soft serve with some secret ingredient that is apparently lost to this day. All I could think of was selling two sticky, gooey, crumbly treats in the middle of a department store seems quite daring and would probably have driven me crazy. Michael Leannah had long-time ties to Lauermans. His father ran the camera department, and then for almost forty years, the stationery department, succeeded by Michael's brother Bruce, who headed it until the store closed. I assume cameras was first, but since the references to the two departments were in different chapters, I couldn't be sure. (As an aside, I learned that it used to be acceptable to pronounce film with two syllables.) So as much as anything, Something for Everyone is a family story, and probably not just for the Leannahs, but for everyone who worked and shopped at Lauermans. More on Something for Everone in EHExtra (that's the Marinette Menominee Eagle Herald). A little more about Marinette on their home page. It's "the city on the bay." Plus Lauerman's Home Furnishings lives on in Marinette. It has the same typeface, but now with an apostrophe.